Here is another look I did with the new Salon Perfect line. At first, I was simply swatching the pink base, but then I felt like jazzing it up with lots and lots of dots. I used a bunch of different Salon Perfect shades and multiple sizes of dotting tools. To me, this look is just so fun and bright and perfect for summer. I don't have the exact list of all the colors I used, but if you have a question about any of them let me know! I wore this to a family get together and a bonfire and I got quite a few compliments on it. 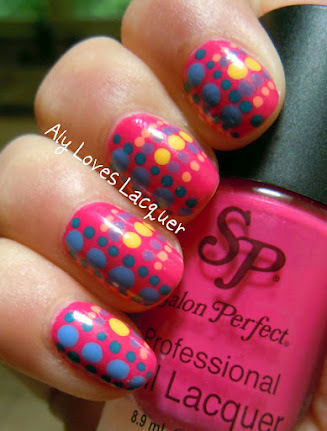 I love dotting manicures because they are very easy to do, but they look really complex. Plus all the bright colors made this look stand out with very little effort. Looks great, I love the colour combination. Hi! I'm Aly, and I love doing nails. butter LONDON Teddy Girl and Trout Pout + Lippy! Stunning China Glaze Summer Neons! Julep Giveaway -- 80+ polishes AND an iPad!